On 03 April 2016 conscripts who jumped from vehicles were shot at in cold blood in front of many people. As a result, some died, some were wounded from the shooting and others were injured when they jumped from the vehicles. A total of 29 conscripts were killed or injured. Six were killed on the spot and eighteen were taken to hospital. Five of those in Halibet hospital have since died of their injuries. The remainder are under under heavy guard. Reliable sources reveal that some of those still in hospital are in a critical condition. The numbers of fatalities may rise. The other names are presently unknown. 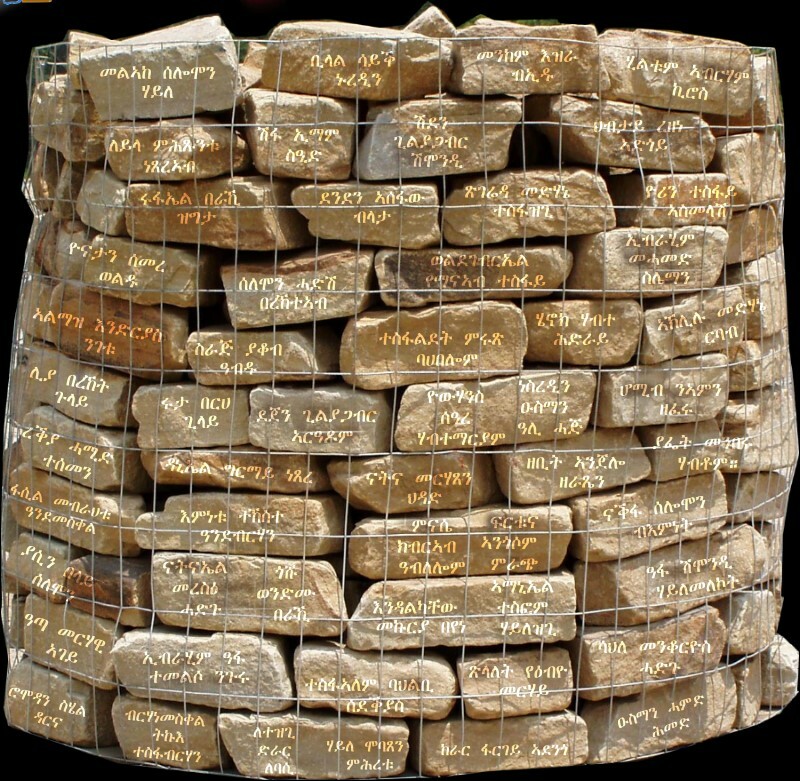 We have all the names of the dead, however since not all the families have been informed the names of most are being withheld. However we will disclose 2 of the youth who died in hospital as their families have been told and have begun mourning. 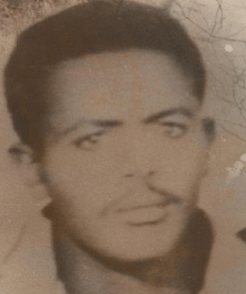 1) Che’ay Haabtesilasie Gebremeskel the son of Mr Habtesilasie Gebremeskel who resides in Adi Guadad and works in a textile factory. 2) Yafiet Fessehaye Mengesha the son of Mr Fessehaye Mengesha who is from Mai Temenai Asmara and works in the transport industry. ብህይወት መኣዛ መን’ዩ ተሓታቲ ? As the EPLF and ELF’s legacy of the execution and killing of innocent fighters during the liberation struggle, the killing of innocent citizens has never stop after the liberation. In fact it was getting much worse during the broader conflict as many member of Eritrean Defence Force were executed by the order of their own military commander. After the end of the conflict with the introducing of Warsai-Yikalo scheme (which is a forced labour slavery project), the youth have become the main victim of the totalitarian fascist regimes than ever before in the history of the Eritrean people. By and large the Eritrean government, instead of promoting democracy and justice has turned into a repressive apparatus, committing crimes against its citizens to subjugate and destroy the spirit of the Eritrean people for justice and democracy. To mention some the PFDJ fascistic crimes. Background information on the 1993 rebellion In 1993, the EPLF veterans ceased the Airport and other installations and brought the government to a stand-still. They held Isaias for hours and forced him to walk with them to the stadium for a meeting. He promised to attend to their grievances and manipulated them to set him free. A few days later, he picked them like ripe fruits one after another and threw them all in jail. Some are either still in jail or had totally disappeared since.Source Get The Old Mellotti Beer! 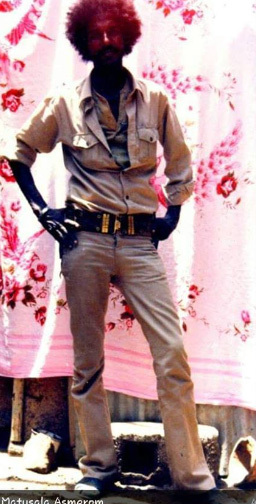 Name of some EPLF fighters who were held in the EPLF prison from 1979 to 1994 and were executed in Congo, 1994? Brief background information.Tsegazeab Okbamariam Zigt was joined the EPLF in 1976 when he was 14. In 1977 he was assigned to the cultural troupe of the Fitewrari (vanguard) at Fah with Mulugeta Beyen( Wedi Zager), Kedija Adem, Wedi Abedella, Wedi Mama and others Fitewrari. 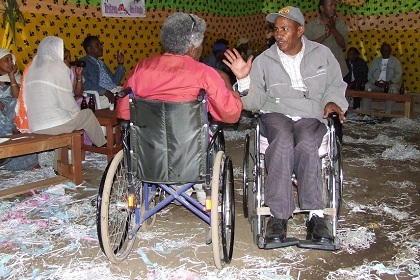 Tsegazeab was a members of the EPLF’s Cultural Troupe from 1976 to 1978. Tsegazeab like Okbagaber want to serve on the front line because of this could be Tsegazeab, Okbagaber and others Fitewrari members of this groups were sent to the Hailitat (front line sometime late in 1978 when the cultural troupe was led by Abdella Jaber. Tsegazeab was executed at Adarsser, near Sawa. 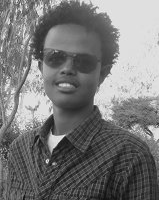 Berhane Gebregziabeher(G15) was arrested in September 2001. ምርሻን ኣዛዚ ቦጦሎኒ ገረዝግሄር /ኤነትረ/ን ናይ ካልኦትን ዝርዝር ናይቲ ፍጻሜታቱን ፈጸምቱን ዕለቱን ኸኣ ብሰፊሑ ምስ ጭብጥታቱ ክንጠቕሶ ክፍትን ኢየ። Source መደባትና፡ ነቲ ኪንዮ ጸሊም ራዕዲ ዘሎ ደበና፡ ምቕንጣጥ ኢዩ! An atrocity was committed on 4th of November 2004 in Adi Abeyto army prison. This was reported by the reliable sources and has been condemned by the international community and by Eritrean communities demonstrating across the world. However, the Eritrean government after claiming that the report was an Ethiopian fabrication called the victims "gangsters" and said that the story was exaggerated. 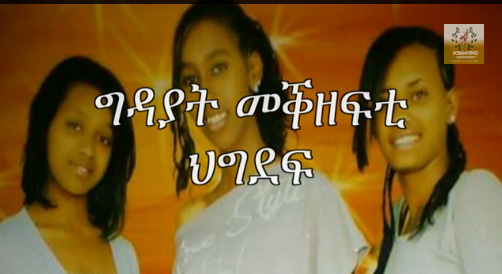 On 10th of June 2005 another tragic story was reported from Asmara in connection with the massacre of 161 young Eritreans at Wei. Regarding this there was no response from the Eritrean government. It occurred in a remote area but the Eritrean government tried to divert people’s attention from the massacre by mobilising supporters to show their sympathy for 40 innocent Ethiopians massacred in cold blood in Addis Ababa in June 2005. It condemned the Ethiopian government through its media EriTv. Sophia Tesfamariam wrote about the cold -blooded of the Ethiopians. 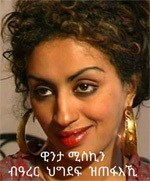 She had never asked why Isyass massacred 161 Eritrean citizens on 10th June 2005 at We'i. Since then the PFDJ leaders stated to executed innoncent citizen on the public for terrorizing. On 12th of September there was a similar brief report associated with pictures on Asmarino. com that showed the killing of one young man who tried to avoid from going to Sawa and was shot dead by government armed forces as a punishment of those who rebel against the government. Tsegazeab was a members of the EPLF’s Cultural Troupe from 1976 to 1978. Tsegazeablike Okbagaber want to serve on the front line because of this could be Tsegazeab, Okbagaber and others Fitewrari members of this groups were sent to the Hailitat (front line sometime late in 1978 when the cultural troupe was led by Abdella Jaber. In 2006 two young Eritrean men were executed by the government in Tessenei town. They were accused of helping people escape to Sudan. a resident of Aqurdat town, Osman Idris Saleh Koy was executed in Forto (near Sawa, Gash-Barka).He was arrested at a teashop in the city, and taken to Forto. The execution took place in the presence of security officials in the region. a resident of Aqurdat town, Osman Idris Saleh Koy was executed in Forto (near Sawa, Gash-Barka).He was arrested at a teashop in the city, and taken to Forto. The execution region. Dirar Hamid, 27 years old. On the 4th of April 2009 Mahari Tewolde 21 years old was shot at the Ethio-Eritrea border by the government’s border security. Helen Beraki, 25 years old. 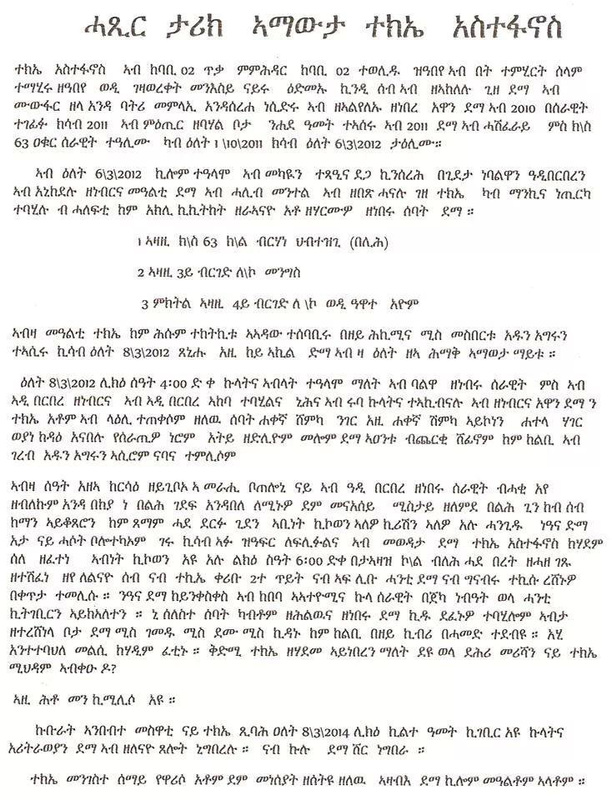 ብ27 ጥቅምቲ 2010 ስርዓት ህግደፍ፡ ኣብ ዘይሕጋዊ ናይ ስግረ ዶብ ስርሓት ተዋፊሮም ጸኒሖም ንዝበሎም ክልተ ዜጋታት፡ ብርክት ዝበለ ቍጽሪ ዘለዎም ተቐማጦ ከተማ ጐልጅ ኣብ ዝተረኽብሉ ብጥይት ረሲንዎም። ንሳቶም ከኣ፡ ተወልደ ብርሃንን ሱሌማን መሓመድን ዝተባህሉ ምዃኖም ተፈሊጡ ኣሎ Source[http://www.harnnet.org. Samuel Gedion said he was among a group of 18 Eritreans who were trying to flee to Ethiopia two weeks ago. “Ten of them were killed, while three of us made it to Ethiopia. I am not sure on the fate of the remaining five,” he said. On 22nd of October a light pickup truck left the city of Asmara carrying 7 young people and 3 children. Each had paid $5,500 to be smuggled across the Eirtrea – Sudan border. Seven of those aboard the truck were absconding national service recruits (5 women and 2 men). The three children (accompanied by an uncle) were on their way to join their mother who had previously fled from the country. At the town of Hykota, a short distance from the border, they were ambushed. The truck was hit by a hail of bullets in a co-ordinated attack ordered by a senior divisional commander. Many were killed outright; others fatally wounded. Among the dead was a young woman, Yohana Kahsay. Just 26 years old, she had one of the three small children on her lap. Yohana was a member of the 26th round of national service recruits who had been conscripted into the army. She had served with the 74th mechanised division for over two years. Following the carnage the wounded were loaded back on a truck, while soldiers went to hunt down those who had fled for their lives. No attempt was made to try to care for the wounded. Residents of Hykota report that the soldiers even stopped at a local teashop on their way to the hospital, by which time everyone was pronounced dead. Families of the victims were not informed and they were hurriedly buried. It took each family weeks to piece together what had happened. Without the bodies of their loved ones they were left to grieve without the comfort of a normal funeral and the associated rituals. These killings have shaken the residents of Asmara where all the people were from, and where their fateful journey began. This report was compiled by Freedom Friday () activists stationed in the vicinity of the incident. They have a complete picture of the massacre including the name of the officer in charge of the operation. This information will be passed to relevant authorities to hold them to account.